Every year Colorado Preservation Inc. hosts a historic preservation conference called Saving Places. In addition to keynote speakers, breakout sessions, and special luncheons, they also host walking tours. 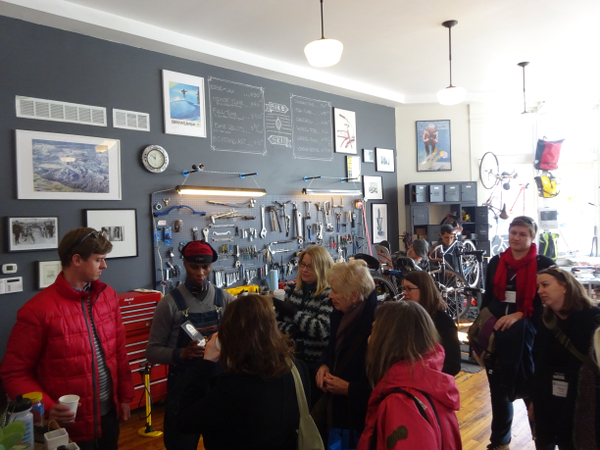 On February 3rd I attended the tour of the historic Five Points neighborhood. Denver, like Fort Collins, was originally oriented to the river. 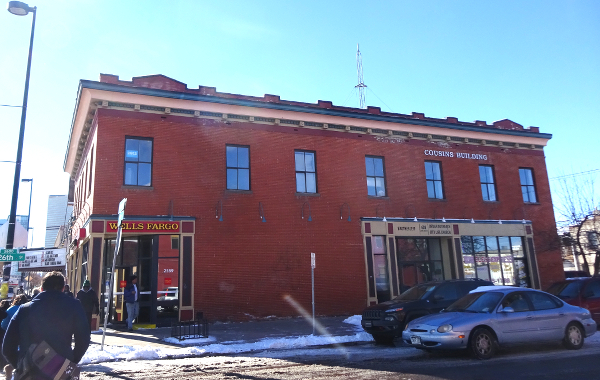 Eventually urban planners decided that it would be better to build a city along a north-south and east-west alignment, which is why in Fort Collins the Old Town Historic District is at a 45 degree angle to the rest of the city, and why in Denver most of the commercial part of town is at an angle to all of the rest of the city. Five Points is so called because one of the early streetcar stops in the neighborhood is right where the old part of town meets up with the new. Five streets radiate out from the intersection and the streetcar stop was called the Five Points stop. Our tour started at the Black American West Museum & Heritage Center (which I’ve written about in the post, “Everybody knows there are no Black cowboys. …right?“) I highly recommend a visit to the museum, which is open Fridays and Saturdays. From there we stopped in at a cafe which is located in a renovated older building on Welton Street. The Purple Door is a non-profit that not only serves the usual cafe fare, but that also employs street kids, giving them job skills and helping them get on their feet. One of the co-owners of the cafe told us the story of fixing their end of the building to make it usable and starting the shop. 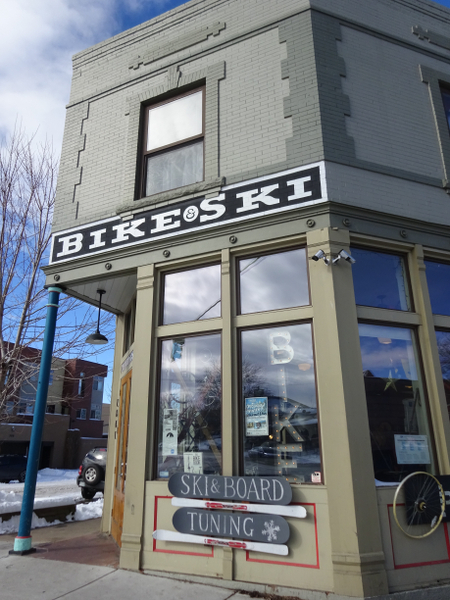 From there we wandered down the street to Chocolate Spokes — a bike, ski, and chocolate shop. Yup, you read that right. Chocolate. 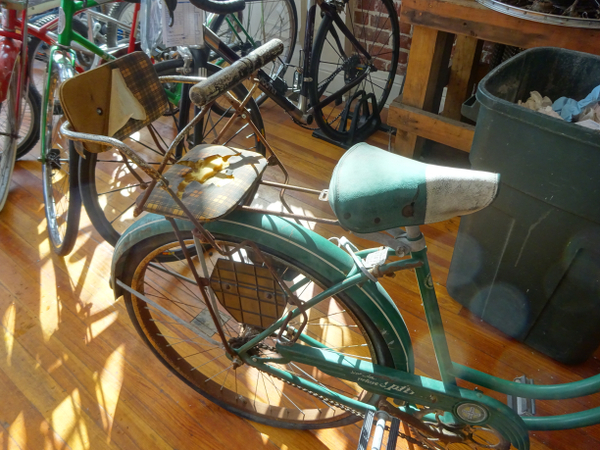 The owner of the bike shop happens to love chocolate. So he decided that in addition to fixing bikes and ski equipment, he’d stock his favorite American made chocolate bars as well. In fact, after getting the story on the building and how it was purchased and renovated, we then got a story on the making of chocolate (and why carefully crafted chocolate can be made with fewer ingredients so that all you’re really getting is pure, authentic perfection). Gregory Crichlow explains the glories of well made chocolate. While the rest of the group got the story on chocolate, I wandered around and took photos of the shop. 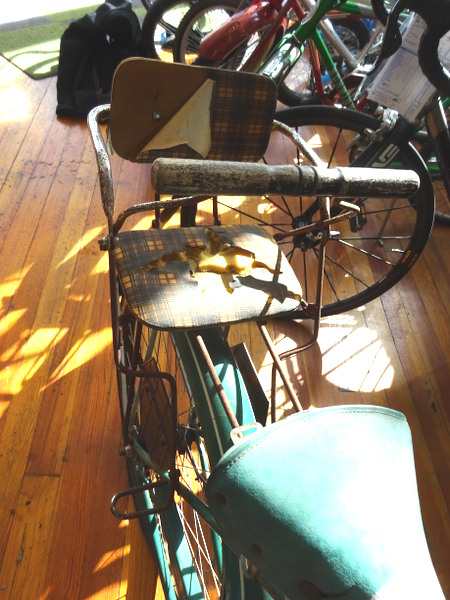 Old child seat on an old bicycle. Another shot of the child seat. Front windows of the bike shop. 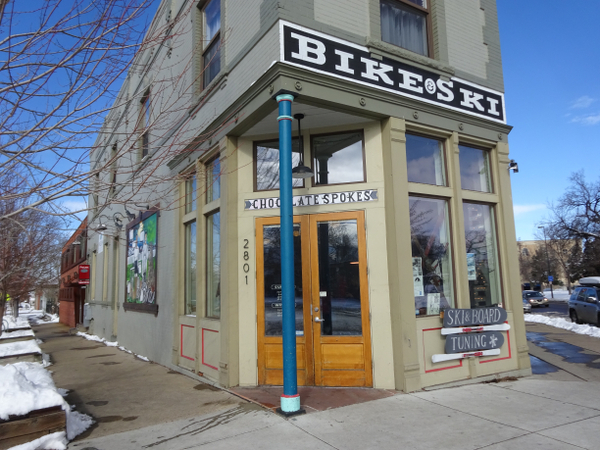 The bike shop sits on one of the funky intersections where the originally platted town meets the “newer” part of town (“newer” meaning 1864, the same year a military camp moved from Laporte to where Old Town Fort Collins is located today). So the building is somewhat oddly shaped, being located on a lot that forms an acute angle. 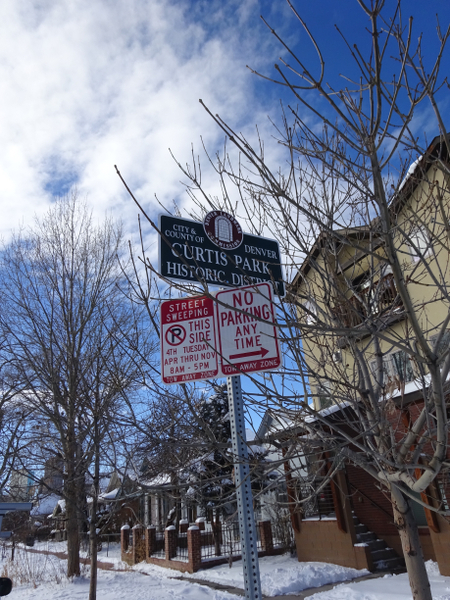 If you’re interested in learning more about how Denver’s streets were laid out, check out this handy Wikipedia post on the Streets System of Denver. There’s a bike mural on the side of the building. Just across the street (behind where I was standing when I took the photo above) is the Curtis Park Historic District. Unfortunately we didn’t walk through that part of town. Based on the few residential houses I saw, there are some absolutely gorgeous homes in this area. (Many are run down, but with a little TLC they’d be really stunning.) I would have been interested in seeing if the homes in the historic district were a little better maintained than those I saw in the rest of the area (given that being designated comes with significant financial assistance). I suppose I’ll have to go back and wander the neighborhood on my own some day to see the parts of town I missed. After the bike shop, we wandered down to the Dunbar Kitchen and Tap House where we had lunch. After lunch, we pretty much stayed on Welton Street, which is the commercial hub of Five Points, and which has been landmarked as a cultural district. I’m still confused on whether it’s actually a historic district or not, though it does have nine contributing historic buildings within the district. 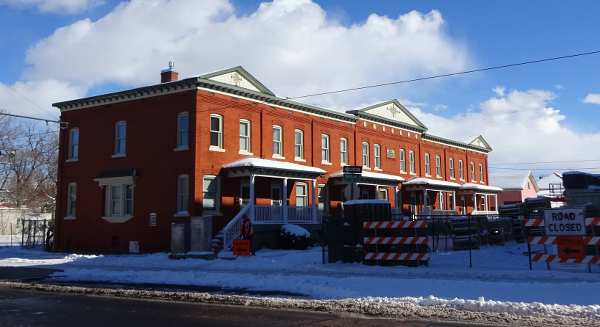 I snapped some photos as we went along, capturing the restored buildings as well as those boarded up, showing that Five Points, as fast as it’s growing, still isn’t quite there yet. 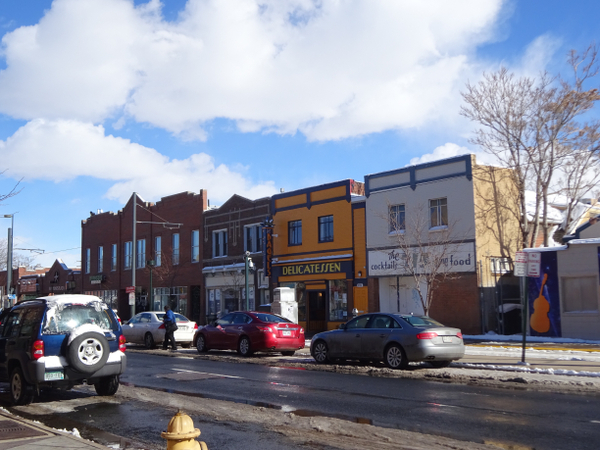 It’s clear that Welton, much like College Avenue here in Fort Collins, used to be a residential street that over time has gradually become more of a commercial center. Though some houses remain residences, many have been converted into businesses. This building is undergoing renovation. 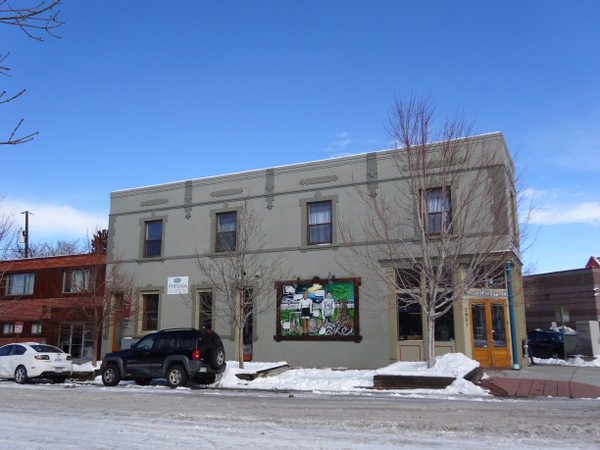 The mural on the left side of the building was uncovered when the stucco that had covered the building was removed during renovation. It’s a sign for a Chinese restaurant that was once located here. 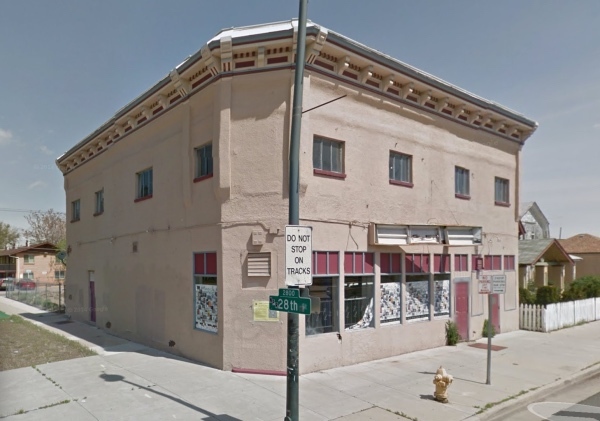 Thanks to Google Streetview, we can see what the building looked like before the renovation was started. 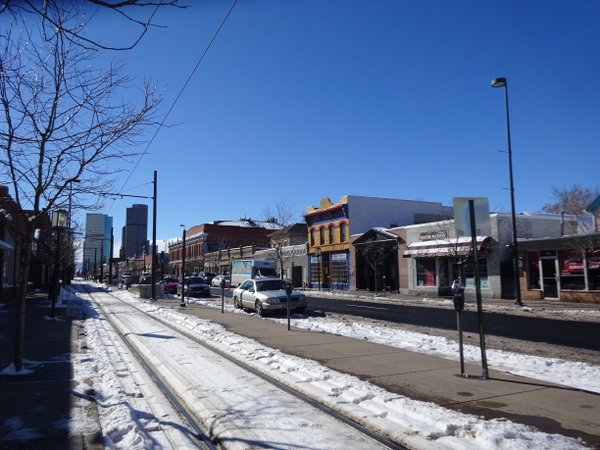 A look down Welton Street towards downtown Denver. Once you get a sense of how close downtown Denver is to this neighborhood, it becomes clear why it’s an up and coming place to live. With the light rail line that not only heads straight downtown but that will also soon connect to DIA, it makes sense that this neighborhood is on the way up. Jack in the box house on Welton Street. 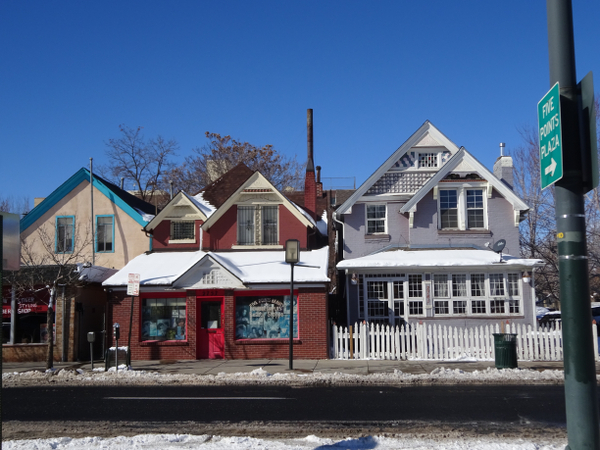 Many of the cute little store fronts have old Victorian houses peeking up from behind. 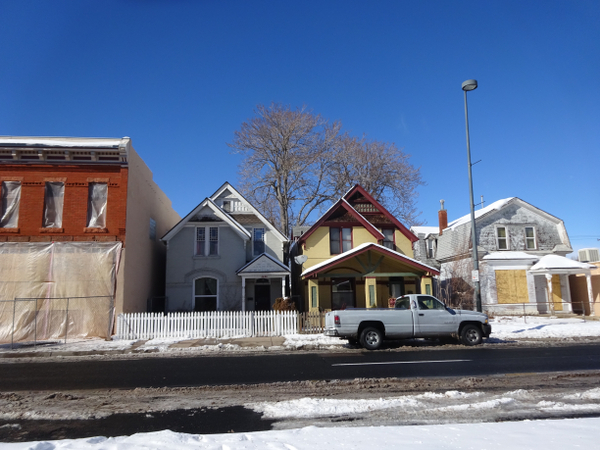 In a post I wrote awhile back on the same phenomenon here in Fort Collins, I termed these Jack-in-the-box houses. The Rossonian – an important historic building in Five Points. Five Points was once called the Harlem of the West because so many well known Black musicians lived or played here. 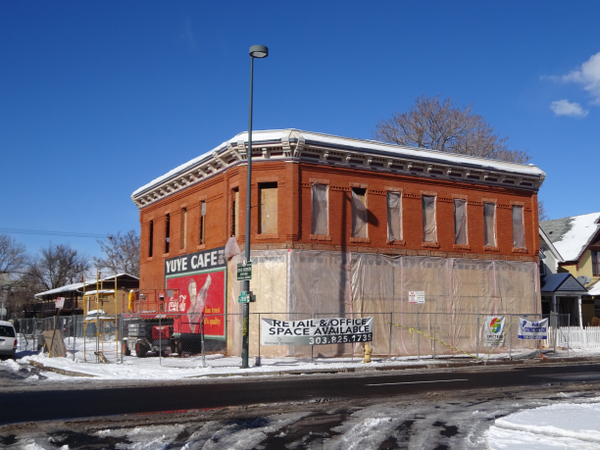 When a Black musician was brought in to play at a gig in downtown Denver, they weren’t allowed to stay the night in the hotels down there, so they’d head over to Five Points where they’d stay at the Rossonian hotel. But it’s said that not much sleeping happened here. It was apparently a hopping party place most nights. 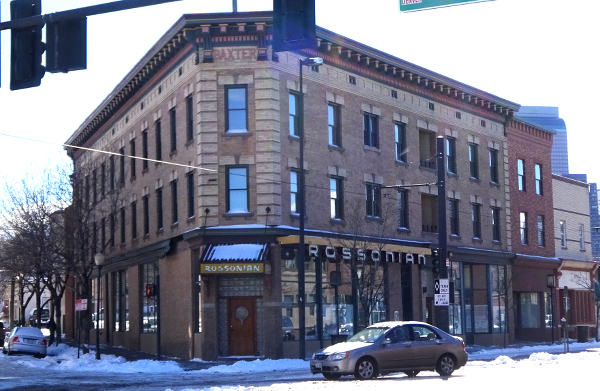 The Rossonian has apparently recently been purchased by a hotel company that it going to renovate it and turn it into a boutique hotel. More shops. You sick of seeing shops yet? The building to the left among these four structures was built probably around the 80s, but look how well the windows on the newer building line up with the windows in the older buildings. 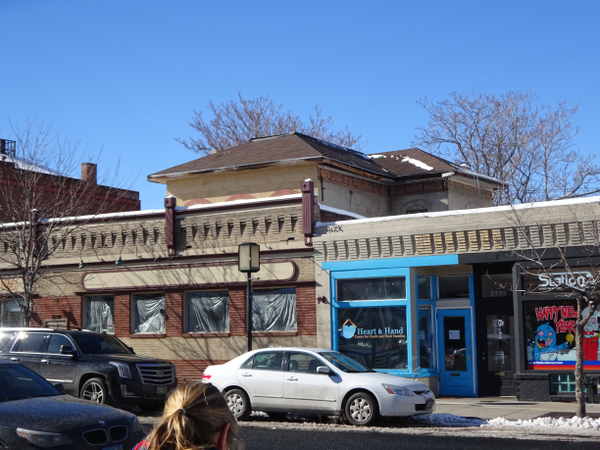 This is one way that developers can help a new building look like it fits in among the old. 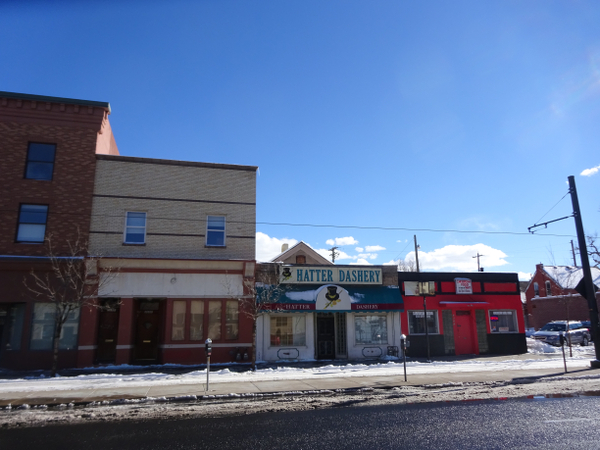 Do you see the little roofline of a house peeking up from behind the Hatter Dashery store? It’s another Jack-in-the-box house. This is the Cousins building. Cousins was an important member of the Five Points community back in the day. This gorgeous apartment building has a vacant lot behind it and the construction equipment you can see in the street in front of it is from the ginormous apartment building that’s going in across the street. Scene from the third story of the Five Points neighborhood branch library, where a Black history museum is located. I mentioned that a ginormous new building was going in across from the cute brick apartment house in the previous picture. That new building is to the left of the above photo. And there’s yet more construction going on that you can see to the right here. According to the gal at the museum, the building of the light rail line took so long to be completed (back in the 90s) that many of the small shops along this part of the street folded. 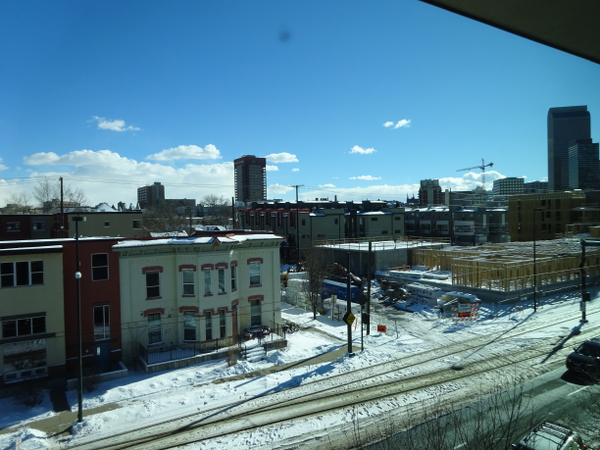 Now those buildings are being scraped and replaced with large new construction projects. There’s a whole lot of history around the Five Points neighborhood which I haven’t addressed at all in this post. If you’d like to dig deeper, I’d suggest visiting the Black American West Museum & Heritage Center that I mentioned at the beginning of this article, or stop in at the Five Points library and head up to the third story where there are some lovely displays about Black history in Denver and the West. But if you’re not up for traveling, you can get a passable sense of the history in the Wikipedia article on the neighborhood. If you’d like to see more photos that I took that focus more on the transportation options I saw while I was in Denver, check out the Pedal Fort Collins post I wrote that includes this same Five Points trip — Photos of light rail and bike share in Denver.